The UK is a representative democracy. This means that we elect officials to represent us and make decisions on our behalf. We elect MPs to represent us in Parliament, councillors to represent us in our local councils and MEPs to represent us in the European Parliament. In Scotland and Wales citizens elect MSPs and AMs to represent them in the Scottish Parliament and the Welsh Assembly. In many cities, Mayors are elected too. In a direct democracy (such as the one which operated in ancient Athens) citizens voted on every issue which concerned them. This is considered unworkable in modern states and only really continues to exist in a few places, township meetings in New England for example. It does, however, remain in the form of the referendum and other forms of direct or popular democracy. Direct Democracy – see above. Also Referenda (Devolution, AV, Elected Mayors, Scottish Independence, Brexit Referendum, June 2016 etc). Also involves recall, initiatives. Used widely in the USA at state level and Switzerland. Impractical to have genuine direct democracy in modern political systems with large population – therefore Rep. Dem may be supplemented with devices of DD. No separate class of professional politicians. Self governance. Representative Democracy – Representative democracy is type of democracy where there are fair, free & regular elections to a range of representative bodies. (Westminster HOC, Local Authorities, Devolved Parliaments and Assembles, Directly elected Mayors, The European Parliament). Under the Fixed Terms Parliament Act (2011) elections to the Westminster Parliament (House of Commons) must take place every 5 years. The last such election took place in May 2015. Elections are Based on near universal suffrage, where there a few exceptions to the right to vote (Under 18, prisoners, Peers in General Elections). Elections also take place to other representative bodies including the devolved Parliaments and Assemblies (Last elections in 2016) or the European Parliament (Last elections in 2014). There are also a range of different electoral systems (FPTP, AMS, STV) to produce different balances of representation. Representative democracy involves participation which is Limited, infrequent and brief. Elections provide peaceful means of transition between governments. Parliamentary Democracy – regular fair and free elections to a representative body in this case parliament and specifically the HOC; rests upon notions of popular consent, electoral legitimacy, strong MP constituency link and provides a balance between elite professional rule and popular participation. Parliament is said to represent the balance of opinion in the country following an election. Parliament has sovereign powers but there are also checks, balances and constraints placed upon it. Government is drawn from parliament and accountable to it. Democratic Legitimacy – lawful exercise of power based on ‘right’ to exercise power. Based on rule of law and is a crucial source of political stability. Usually conferred by election and the securing of a mandate (popular consent). Could be conferred by constitutional legitimacy. E.G. Brown replacing Blair (2007) Major replacing Thatcher (1990) or May replacing Cameron (2016). Constitutionally this is legitimate without an election in the British System of Government. Legitimacy is subject to continuous or periodic consent e.g. fixed elections and there is a debate as to whether Theresa May has a mandate (and therefore the legitimacy) to take the UK out of the single market. Mandate – permission or legitimacy to govern. Usually secured via election and popular consent. Manifesto commitments are seen to be given a mandate when the party proposing them gains a parliamentary majority. Mandate may come into question under minority governments, coalition, confidence and supply arrangements or informal agreements between parties when their is no overall majority. Mandate is assumed through clear decisive majority in parliament and plurality of the vote. A Party does not require 50% support of the electorate to claim a mandate. (NB – no party since the war has achieved 50 of the popular vote. Recall – the process whereby a popular vote is held within a constituency to remove a sitting MP between elections. Recall of MPs Act 2015. This can take place where a sitting MP is imprisoned or suspended from sitting in parliament by the speaker for more than 21 days. A petition is raised in the MPs constituency and more than 10% of constituents must sign to trigger a by-election. The recalled MP can still take part in the by-election. Constituent trust over their elected representatives following the expenses scandal in 2009 appears to be the trigger for this reform. Jacob Rees-Mogg and Zac Goldsmith were particularly critical of the restrictive way in which government had enacted this legislation. Democratic Deficit – a circumstance, or set of circumstances, in which democracy is seen to be failing. There are many aspects of the UK’s system which could be said to amount to a democratic deficit. Unelected HOL; FPTP*; Apathy and low turnout; lack of political education and understanding; remote and unaccountable EU and domestic political institutions; Absence of difference between the parties; Social representation of women and ethnic minorities in parliament and cabinet, the civil service and the judiciary; Corruption in high office; biased media/judiciary; Unelected Head of State; Insider PG dominance and corporate dominance over Government (Monbiot – Captive State – The Corporate takeover of Britain, 2000). *Note from 2015 GE UKIP 12.4% of vote, 1 seat, SNP 4.7 % 56 seats – is this not profoundly undemocratic? Also 63.1 % did not vote Conservative, yet they obtained a majority of 12 seats on 36.9% of the vote or just 24.4% of the electorate as a whole. Simple Plurality – the general principle for electing MPs and forming governments. An MP does not need a majority of his/her constituents votes to be elected, merely more than any other single candidate. Similarly governments are often formed on the basis of a plurality of the vote e.g Conservatives 2015 GE, 36.9% – more than any other party but NOT a majority. FPTP then often translates this into a majority of seats. 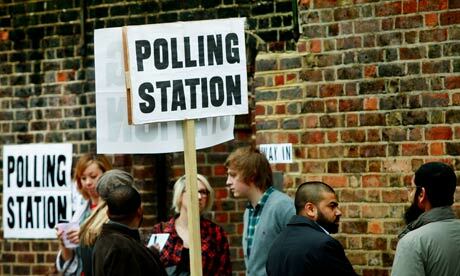 Political participation – there are a number of modes of political participation. 1. Voting in elections to elect representatives to a variety of representative bodies. 2. Voting in a referendum. 3. Joining a pressure group and taking part in a range of pressure group activities. 4. Spontaneous participation. 5 Citizen Juries. 6. focus groups. 7. joining a political party, volunteering, canvassing, attending constituency meetings, participating in leadership elections. This question is more challenging and 7 of the 10 marks will be awarded for AO1 and 3 will be awarded for AO2. This means you will have two marks on this question. AO1, examines “accurate and relevant factual knowledge”, but AO2 takes this further and requires that candidates show the “ability to explain, not just describe [giving reasons for, or causes of, something; showing how something works]”. This means that candidates do not simply explain an issue, but they also provide some ANALYSIS as well. Also note 58% turnout of 18-24 Olds in 2015 General Election, compared to 44% in 2005. This needs fleshing out with detail. Here are some past paper C) questions on representation and democracy to consider. * This question caused quite a a stir last year. At some point we will look at why it was actually a lot more straightforward than most candidates thought! Hello, I really appreciate your documents on Conservatism, Liberalism and Socialism. Do you have any resources for unit 1 & 2 at all please, they are life savers! Thank you! Please accept my apologies for the late approval of your comment and response. The short answer to your question is no. However. I have had many comments on these particular resources which for some strange reason baffle me – that being that they are hugely popular. They are actually no different from the notes posted on the website other than the format they are presented in. Your comment reminds me of course that there are different forms of presenting information that some students prefer over others. Whilst I am massively busy with my own students I am willing to try to find the time to produce similar documents for wider distribution so please watch this space as I rebuild and update the site. Don’t feel inhibited in reminding me if it’s not done soon. The resources are clearly appreciated so it’s obviously a good idea if I produce them for each topic. Thank you for all your resources! I was just wondering if you ran any Easter revision sessions or long-distance tutoring at all to help prepare for exams? I am running Easter Revision sessions through the college I teach at, but only covering A2 Global Politics. The college is in London and I’m not sure where you are based. It is a private college and therefore charges pretty high fees for an Easter Revision course. One of the reasons I do the blog is to put something back into the large community of students who cannot access private education. I have been doing this a number of years, and I am an examiner so I feel bound to share my resources and insights. Long distance tutoring could be arranged but it’s not something I’ve really done before and I’m not sure how it would work. My time is obviously massively geared towards my own students from here through to June. Are you a Faculty Head at a college in Bristol? I have a LinkedIn invite from someone and I think that may be you. P.S. Apologies if this is a coincidence and unrelated to you. Aaah…the penny has dropped…I thought for some time you were a student. I take it that your interest is that some of your students are using the blog? Yes, I’m using it myself to study but have also passed it on to other students as it is just so useful and the quality of the revision documents in particular is just excellent! Glad you find the blog entries useful. I’ve still quite a bit of updating to do on the A2 side of things…which A2 route(s) do your students follow?